You are looking to buy a house. You find one that looks great from the curb. Fresh paint, newly sodded lawn. Inside, there is no electricity. Fetid pools of water collect as water drips through the roof. Roaches scuttle under floorboards at your approach. The staircase, rotted, is half-collapsed. And the stench. Oh my. You probably could have flipped it for 2x in a couple years at the height of subprime lunacy anyway. As the Nasdaq flirts with new all-time highs, nearly every systemic underpinning of the world economy is corroding in plain sight. But so long as central-bank-rigged stock market rallies seem intact, nobody cares. Just like with subprime mortgages, as long as everyone is making money, everyone will ignore obvious realities. Until they can’t, and by then, it’s too late. Draghi at the ECB has created a monumental economic disaster he is just praying to holding off until he leaves next year. Interest rates are already starting to rise significantly in several important money and interbank markets. Both banks and debtors are facing a rapid rise in interest expenditures that will shock the world. This is going to blow-out budgets around the globe and both private and public debtors face higher costs of funds. 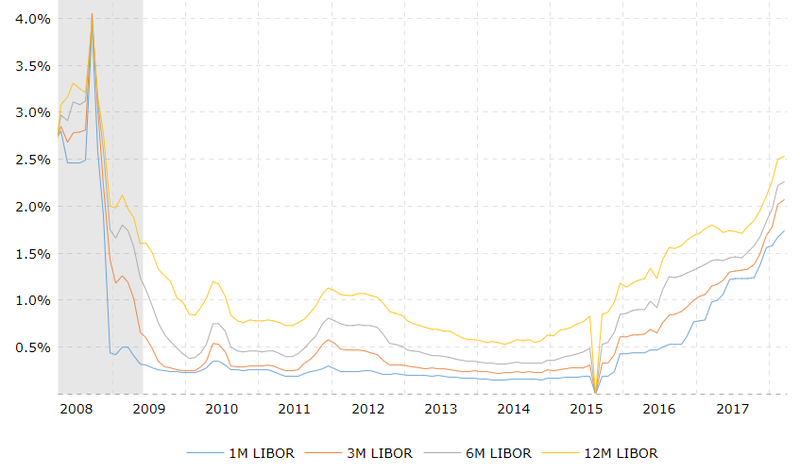 The Libor (London Interbank Offered Rate), the most important reference rate for the global interbank market, is currently at its highest level since 2008. We are looking at LIBOR rates rising sharply. The dollar-lending rate for dollar loans has been rising steadily in all maturities since about the end of 2014. The dollar-Libor for three-month loans in March 2017 were trading at around 1.1%. Currently, this dollar-Libor rate stands at around 2%. A closing on an annual basis above 208 will signal rates will rapidly more than DOUBLE into 2020. A closing above 510 on an annual basis will warn of a MAJOR financial crisis hitting just about every economy.